Get unlimited access to 200+ WordPress tutorial videos across 10 courses with an All-Access Pass. You’ll quickly learn all the WordPress basics… plus much more! Your All-Access Pass includes our brand new, 34-part WordPress 101 course, which has been completely rewritten for the all-new Gutenberg Block Editor in WordPress 5.0 and newer! You'll not only enjoy unlimited access to the new WordPress 101 course, but also 200+ tutorial videos across 10 courses. Plus, you'll get every new course we create while your subscription is active! In addition to WordPress basics, you'll also learn how to optimize your site for search engines, how to sell products online, and much more. Watch the videos anytime, anywhere from your favorite device. Want a deeper dive into Gutenberg? This 17-part video course by Joe Casabona will introduce you to the all-new Block Editor in WordPress and show you how to use all of its exciting new features. 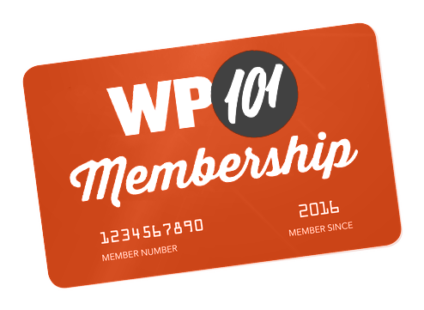 Your membership to WP101 includes this course, plus early access to all new classes. This 42-part tutorial series will teach you how to keep your site secure, increase traffic, and add dozens of popular features to your site using the all-in-one Jetpack plugin from Automattic. We partnered with popular WordPress educator, Zac Gordon, to create this comprehensive guide for beginners. Your membership to WP101 includes this course, plus early access to all new classes. You'll also get 32 tutorials for WooCommerce, the most popular e-commerce plugin for WordPress. We partnered with WooCommerce expert, Joe Casabona, to create the WooCommerce Quick Start for beginners, as well as a more comprehensive, 22-part WooCommerce course that covers every panel and setting. Your membership includes both of these courses, plus early access to all new classes. Learn how to create just about any type of custom form you can imagine, from simple contact forms to event registrations, file uploads, payments, and more. We partnered with the Ninja Forms team to create this easy, 18-part course for their popular Ninja Forms plugin. Your membership to WP101 includes this course, plus early access to all new classes. This easy, 20-minute course will introduce you to the MailPoet email newsletter plugin for WordPress. Learn how to build an email list, create and send welcome emails, automatic post updates, and email newsletters to your audience today! We partnered with the MailPoet team to create this simple, 8-part introduction to the MailPoet plugin. Your membership to WP101 includes this course, plus early access to all new classes. We partnered with Joost de Valk to create this definitive course for his popular Yoast SEO plugin. This 15-part course will not only teach you how to configure and use this popular SEO plugin for WordPress, but also WHY all those settings are important. Your membership to WP101 includes this course, plus early access to all new classes. Stop wasting time scouring homemade videos on YouTube! Our video tutorials will teach you all the WordPress basics in about an hour. Since we launched in 2008, our WordPress 101 videos have helped two million beginners learn how to use WordPress! Since 2008, we've updated our WordPress 101 series with every release of WordPress, ensuring you're always up-to-date. All of our videos are closed-captioned for the hearing impaired, providing equal access to the best WordPress training. Ask your WordPress questions in our members-only help forum, and get expert answers from our WordPress instructors. For more than 10 years, we've continually updated and improved our WordPress 101 tutorial videos to ensure they're the fastest and easiest way to learn how to use WordPress. But, we’ll be the first to admit we’re a little biased. That’s why we invite you to try WP101 for up to 30 days. If you don’t learn how to use WordPress like you had hoped, simply cancel your subscription and reach out for a complete refund. How does that sound?